Resistance training is any exercise that causes the muscles to contract against an external resistance. Traditionally dumbbells or barbells were used for resistance, however, these can be big and bulky, especially when transporting. Our range of stretch resistance products features pioneering products that allow you to do resistance training wherever you are. Lightweight, compact, easy to use and suitable for all levels of strength. Plus, many of our Stretch Resistance products are on our 4 for 3 Mix & Match deal so you can create your very own bespoke training kit at a great price. 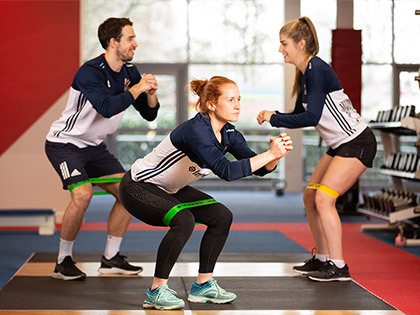 Minibands are underrated high-quality elastic loops that are perfect for training and rehab exercises for the upper body, lower body, plyometric and abs. They’re light and compact, making them ideal for using anywhere – on the field, at home, in the clinic or at the gym. They can be easily incorporated into a range of exercises to help you make the most of lateral movements, stabilisation, and posture work, or to instantly increase the effectiveness of your workout. They can be used to help you warm up (e.g. glute walks), cool down (e.g. plank jacks) or as part of a high-intensity workout (e.g. bear crawl, crunches and glute bridge). Options available: Physique Miniband and Perform Better Mini Band. Fitness bands are simple versatile tools designed to help correct body positioning when stretching. They are extra-strong bands that are very effective for each main muscle groups and can be used for a variety of strength, speed, flexibility, mobility and rehabilitation exercises for the lower body, back, chest, shoulders, arms, and core. They come in a variety of sizes and provide progressive resistance for all strength levels. They’re great for ramping up your workout routine and can be easily incorporated into a range of exercises such as squats, crunches, chest press and standing bicep curl. Options available: Physique Fitness Band, Jumpstretch Bands, RockBands, StretchBands, and Elastiband. Fitness cords are great for general stretching, strength, rehab and training exercises for your arms, abs, legs, and back. They are a popular choice for physiotherapists and personal trainers as they can be easily integrated into your current workout routines, such as cross fit, yoga, and Pilates. They’re available in a variety of sizes, lengths, and strengths and come supplied with a handle on each end. The Physique Fitness Cord comes in an extra economical 20m length which can be cut to the required size. Ideal for circuit classes where participants are of a differing height and may require a longer or shorter length. Options Available: Physique Fitness Cord and The JC Pro-Line Sport Band. Great product, high quality and good value. These mini bands are very good quality and a perfect size for crab walking and mini band pull aparts. Item is exactly as detailed. Great item and very good quality for the relative cost. My 6-year old is using this in her gymnastics class and loves it! Very bright and not easy to mislay - so i love it too! Great item and great cost. Would recommend. Product arrived fine but 3 days late after i had paid for next day courier delivery. Not good service. These bands are currently my favourite rehab tool. 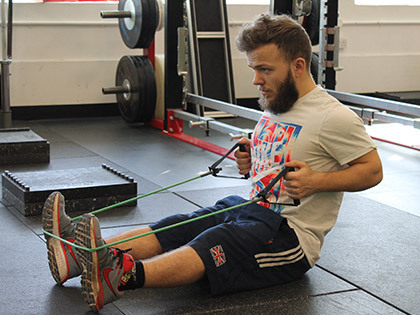 4 varied strengths to differentiate between injury / fitness ability. Strong, durable, easy to carry around. Great for holiday hotel room circuit session ?? Excellent strength and rehab tool. Loads of useful exercises with this. So light and easy to pack with my kit. I take it everywhere..
Great piece of kit! Can be used in many different ways to assist with stretching.